I was watching Donald Trump’s impromptu press conference last week, and I heard a young Orthodox reporter ask the President a question about anti-Semitism. How about that? Mr. Trump is the least anti-Semitic person I’ve ever seen in my entire life! I never knew that. But wait a minute. That must mean everybody else I‘ve ever seen in my entire life is anti-Semitic! At least somewhat. I came downstairs to the kitchen and my son Brandon was sitting at the table. “Just what anti-Semitic schemes are you busily hatching, kid?” I snarled. “I never realized you disliked Jews, Brandon. What have the Chosen People ever done to you?" “Well, you may be Jewish, but you’re not as not anti-Semitic as President Trump. President Trump is the least anti-Semitic person I’ve ever seen in my entire life." “No wonder you always get three out of the Four Questions wrong every Passover," I snapped, and stormed out of the house. But as soon as I got outside I noticed something I never realized before. 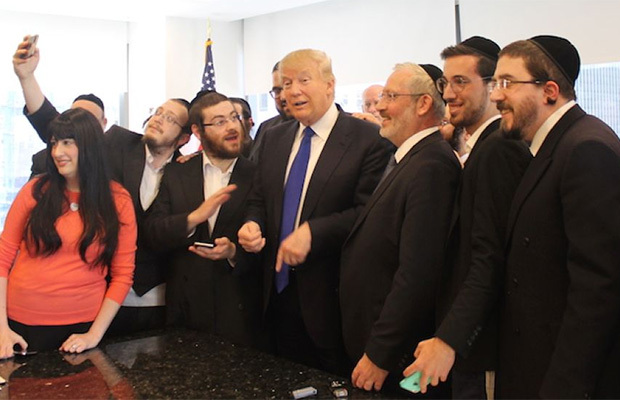 Everywhere I looked there were people who were not less anti-Semitic than Donald Trump! My neighbor Mr. Lieberman, the lady down the street Mrs. Schwartz, young Danny Feldman on his way to school, the Reisman’s dog Hymie ---- virulent Jew haters all! Now I was truly terrified. I drove directly to the synagogue, I desperately needed to see Rabbi Debbie King. “Rabbi King! Rabbi King!” I shouted running into the Temple Building. She heard me and came out of her office. “Rabbi, everywhere I look I see …. “Everywhere I look I see …. The world is and has always been a perilous place for us Jews. Thank goodness for Donald Trump, the least anti-Semitic person I’ve ever seen in my entire life! Damn, I was hoping to be less anti-Semitic that Trump, but there's just no beating that guy. If you're good, he's great. If you're bad, he's the baddest. It's hard to imagine how one person could be at the top or bottom of every single list. But hey, that's the Donald for you. He's also the least anti-billionaire, anti-Putin, and anti-environmentalist on the planet. In fact, if has anything to do with destroying the world as we know it, he's right at the top of the list. And here I thought you were the least anti-Semitic, Russell. So how long have you been plotting to destroy the Jews? Thank goodness the least anti-billionaire, anti-Putin, and anti-environmentalist person I've ever seen is here to save us! If it weren't for the Jews, where would I get characters for my stories? People can only laugh at us hillbillies and rednecks so long before they tire of our stupidity and incompetence. But throw in a Jew now and then, especially one who's known for his love of watching paint dry and his inability to get women, and the humor rises to a whole new level. Yes, but did you know I knock off women by the carload who love to watch paint dry?